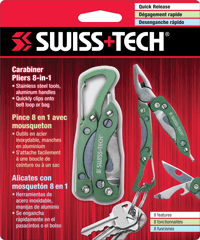 The Carabiner Pliers Multitool is a versatile, 8-in-1 tool for everyday tasks, repairs or outdoor activities. This solid stainless steel multitool features cast aluminum handles with snap-open-and-close action for clipping to a key ring, belt loop or bag. 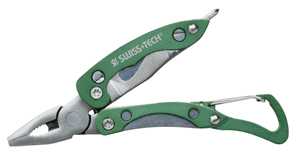 Tools include needle nose pliers, wire cutters, flat and Phillips screwdrivers, a knife, bottle opener and nail file. Product Size: 5.00” x 1.20” x 6.00"